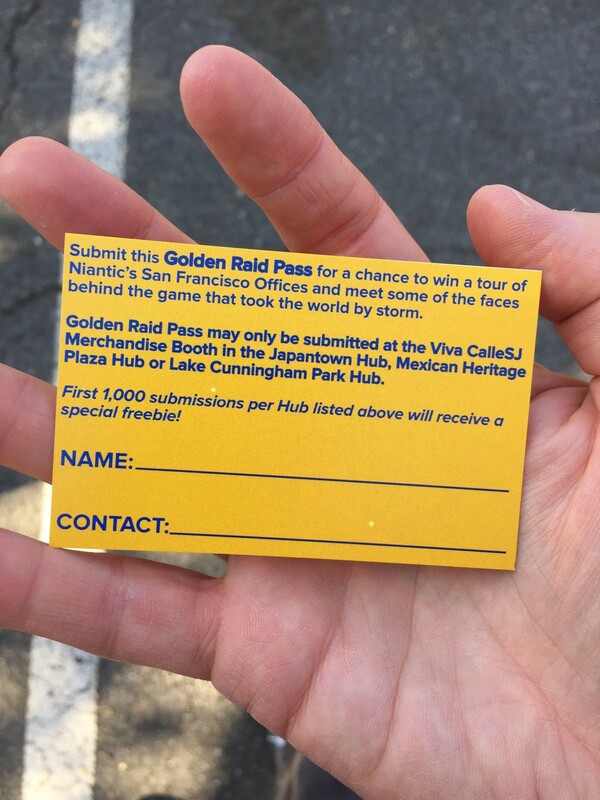 On the day of the event, “Golden Raid Passes” were distributed by Niantic Ambassadors along the route. 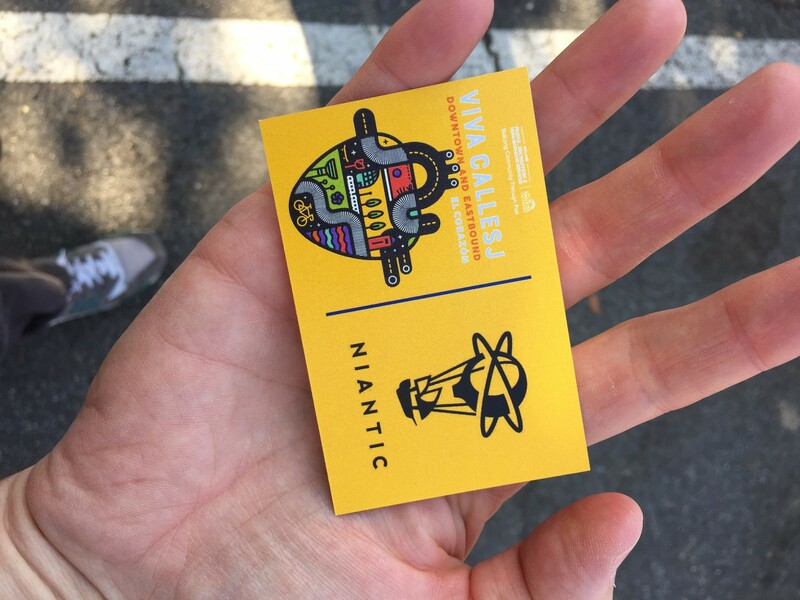 Having one of these physical passes at any of the major event stops allowed players to enter into a raffle for a tour of Niantic headquarters, plus a special poster and team wristband. Niantic and the city also worked to increase spawn rates and raid activity. This kept players spread out and moving. Some of the most interesting conversations held between strangers seemed to happen just post raid. After raids players would routinely chat about where they were from, what group they had come in with, and what their strategies were. All without ever exchanging names. Players gathered for an early raid. Split mostly into team clumps. Most of these players didn’t come together or only in groups of 2-3. But as the raid was finishing and after there was a burst of social sharing and connection between strangers. The most consistent moments that I saw of players engaging beyond the game were around food and seating. If there were places to rest, in the shade and food stands players would stop, exchange stories with others and watch the events going on at the hub. 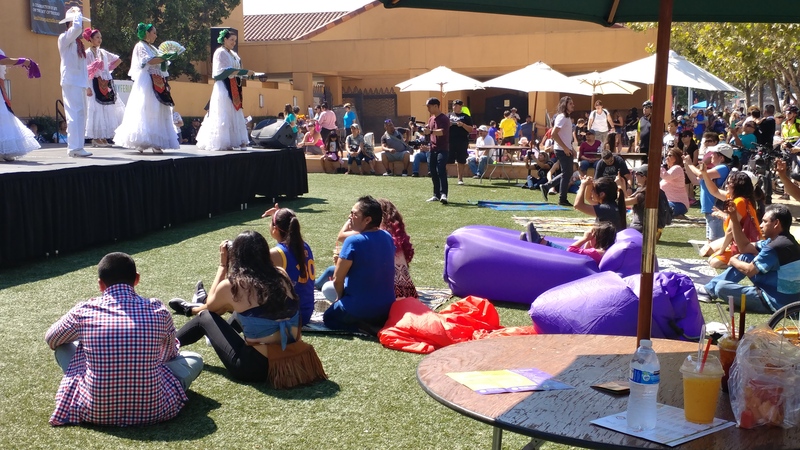 This was especially evident at Mexican Heritage Plaza where large dance spectacles and community art activities drew players in. Many players stopped to get food and drink here at Mexican Heritage Plaza and sit in the shade while watching dance performances before hitting the long open stretches of road again. In contrast the cyclists seemed a little more attentive to city directed events and announcements. 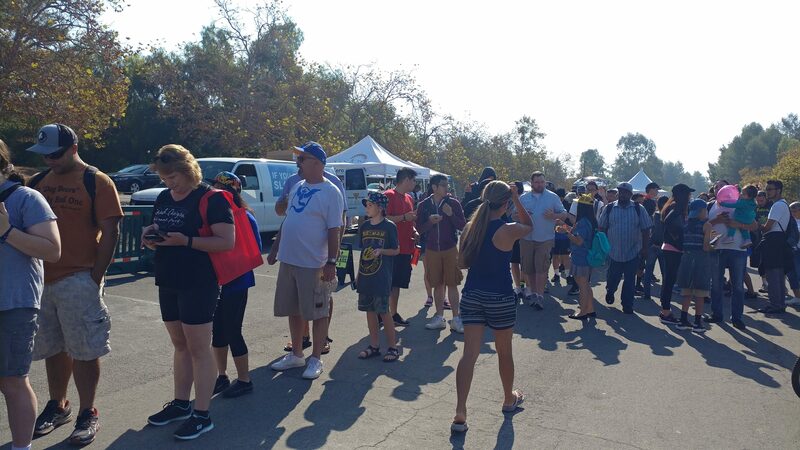 As Pokémon GO players lined up for raid passes they completely ignored city announcements and framing of the event. Conversation with amassed players at the beginning of the event seemed to indicate that players and cyclists and others were largely attending different events all while sharing the same space. Players seemed to know very little about the city organized aspects of the event. Players lined up to turn in their golden raid passes before the event was even officially started. All this was while the opening remarks were being made just behind them. A rumor started, among Pokémon GO players, that the event started at Japantown and or that there would be a legendary raid there. This contributed to very large crowds at Japantown in comparison with some of the other hub sites. 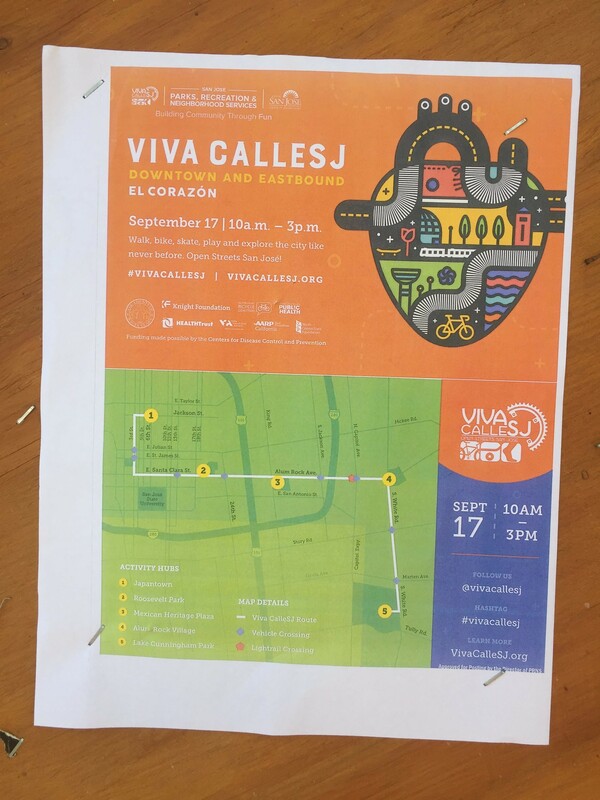 The golden raid passes that Vive Calle used to distribute collectable posters and enter players into raffles. Players had to go to a hub point to get these in the first place. Then they needed to find an event employee/volunteer wearing a pikachu hat to stamp it. Then they could retrieve their prize. Finding the one individual at any given hub who could stamp these for you was daunting to say the least even though it did give a Where’s Waldo feel to this city’s intervention. San Jose itself was comparatively more engaged than some of the other cities we’ve observed in the Pokémon GO specific element of the event. 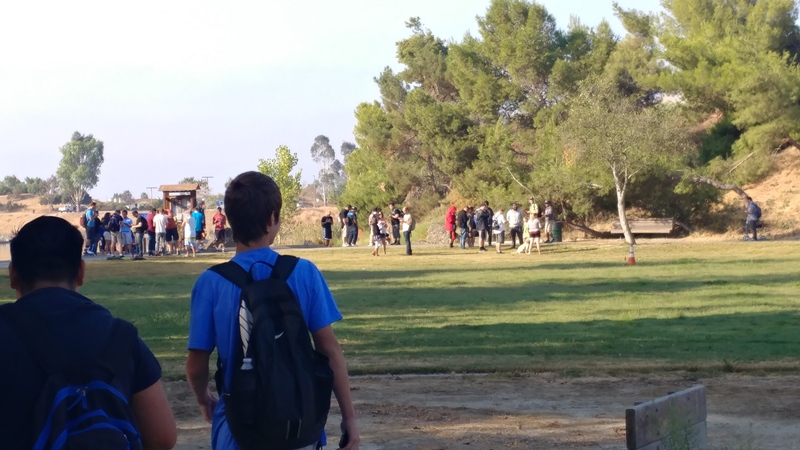 At Parks and Rec there were roughly three layers of coordination that all worked together but they had one person, Zak Mendez, who was himself a committed Pokémon GO player who did a lot of the leg work. He explored the route himself and gathered data on the number of stops and gyms present along the route and generally provided a somewhat player insider link. 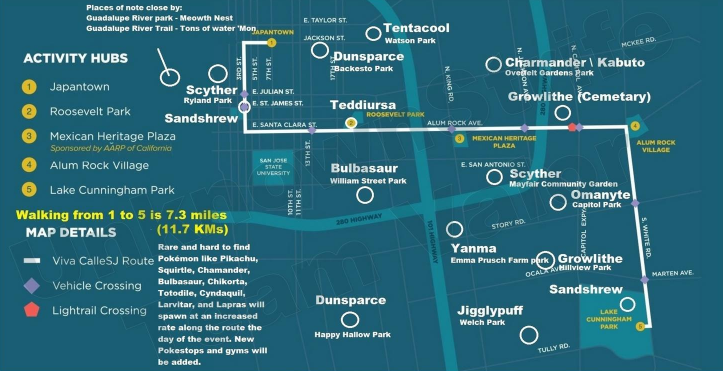 They added 13-19 more stops along the entire route in coordination with Niantic. The city got to write the text. Spawn rates were also increased around event hubs. One key component of the work coordinating between Niantic and The City was an awareness of underlying infrastructure concerns. San José was well equipped to host an event of this size especially given how spread out the route was. There was some social media engagement of players and attempts to announce through official channels that there was not going to be special raids or regionals. 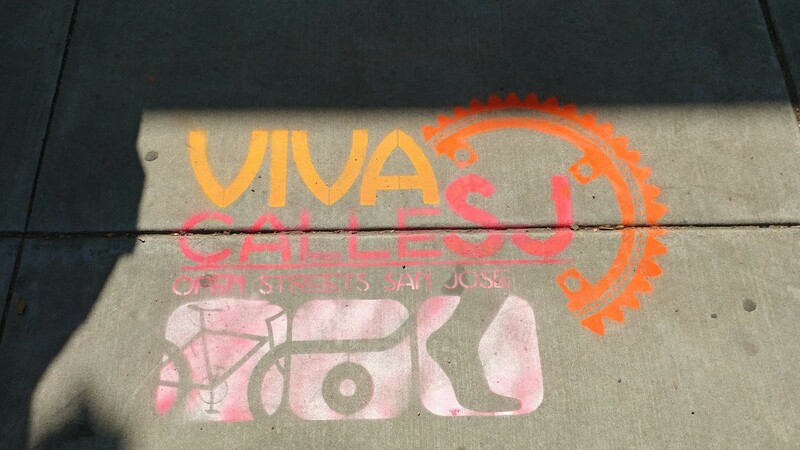 There was a radio interview done by city officials as well as routine updates on the Vive Calle website. The golden raid pass program was advertised ahead of time via social media. Those marketing the event would like to do deeper social media engagement prior to future events. A lack of deep engagement with player organized social networks (Raid groups on facebook, discord, etc) seemed to contribute to rumors/misinformation about legendary raids and other special events. Physical paper posters on park message boards and telephone poles were also used another channel for outreach. – Making individuals the point of contact for a physical intervention can make it harder to execute and frustrating for players.